Summer is one of my favorite times of the year and one of the reasons is due to the availability of cherries. Most of the grocery stores contain Bing or Mount Rainer cherries. If you are lucky enough, you may have a cherry tree that produces ripe cherries for picking in the summer. Cherries are a sweet, tart and tasty fruit that are actually very good for you. Cherries have been around for centuries from the Roman conquerors, to the Greeks, Persian kings and the Chinese warriors. Cherries are believed to be consumed since prehistoric times. Sweet cherries are closely related to the wild cherries that were indigenous in the region that lie between the Black and the Caspian Sea. The sour cherry is thought to be a hybrid between the sweet cherry and the ground cherry that grew in the eastern and central portion of Europe. Cherries contain vitamins, minerals and have many documented health benefits. Some believe that cherries contain the highest levels of antioxidants when compared to other fruits. Cherries contain vitamin C, A, B, bioflavonoids, anthocyanins, magnesium, folate, ellagic acid, potassium, perillyl, melatonin, iron, and fiber. Cherries also contain anti-oxidants which are essential in fighting free radicals in the system. Free radicals cause damage to the body’s healthy cells. Research on the medicinal benefits from eating cherries mainly comes from the tart cherry. These benefits include prevention of heart disease and lowering of LDL cholesterol, jet lag, improved mental functioning, decreased memory loss, fibromyalgia symptoms, pain of arthritis, gout, headaches, urinary tract infections and constipation. Cherries have been shown to increase metabolism and improve fatigue and aid in weight loss. Cherries may be beneficial in the protection of cancers of esophagus, stomach and digestive system due to their high levels of flavonoids and anthocyanins. New research from Oregon Health & Science University shows that people who drank tart cherry juice while training for a long distance run reported significantly less pain after exercise than those who didn’t drink the juice. Cherries are a natural anti-inflammatory agent that helps alleviate the post-exercise inflammation. 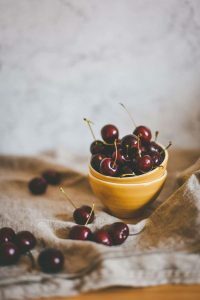 This is important for the weekend warrior or the athlete because they can use a use the natural anti-inflammatory power of cherries instead of taking over-the-counter pain medication to reduce muscle pain. Another study showed that with sixty healthy adults aged 18-50 years, those who drank 10.5 ounces cherry juice twice a day for seven days prior to and on the day of a long-distance relay had significantly less muscle pain following the race than those who drank another fruit juice beverage. Future research in examining cherries as a potential source of lowering blood sugar in diabetic patients is around the corner. Enjoy the sweet or tart cherries while they last because not only are they good but they have many healthy benefits.